Melvin Leon Stottlemyer was born on November 13, 1941 in Hazleton, Missouri. 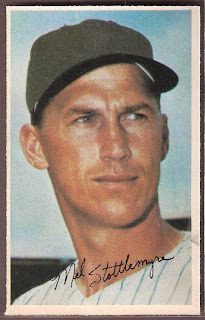 The tall sinkerball right handed pitcher was signed by the AL New York club as an amateur free agent in 1961. He won 17 games in the Carolina League in 1962, getting promoted to AAA in 1962 where he struggled at 7-7. In 1964 he went 14-3 getting promoted to the big league club in mid June. On September 26th 1964, he pitched a two hit shutout against the Senators in Washington & went 5-5 at the plate. Stottlemyre went 9-3 behind Whitey Ford, Jim Bouton & Al Downing posting the staffs best ERA at 2.06 pitching in 13 games. Mel was an instant star, making the cover of the Sporting News & getting to the 1964 World Series. 1964 World Series: In the World Series, Stottlemyre faced St. Louis Cardinal Hall of Fame pitcher, Bob Gibson three times in the seven-game Series. 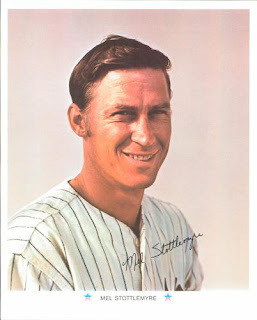 Stottlemyre beat Gibson in Game #2, pitching seven innings, allowing three runs. In Game #5 he earned a no decision, as he gave up just two runs in seven innings while striking out six. This game evened the series at one game apiece. He took the loss in the decisive Game #7, being removed in the 4th inning after giving up, three runs, three hits & a walk as St. Louis won the game & World Series behind Gibson’s great pitching. 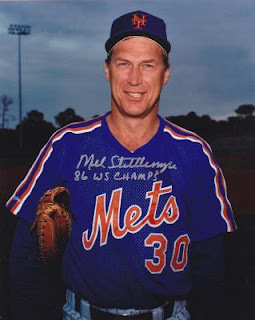 Stottlemyre would pitch ten more seasons with the AL New York team and never make another post season appearance as they would only finish as high as second one time in those years. Mel would have three twenty win seasons for himself, making five All Star teams. He led the league in complete games & losses twice & innings once. In his second season, 1965- he went 20-9 (second most wins in the AL) leading the league in complete games (18) & innings pitched (291) posting a 2.63 ERA. He made his first All Star appearances that year as well. The next year his team finished in last place, tenth of ten, and Mel led the league with twenty losses (going 12-20). After a .500 (15-15) season in 1967, he won twenty games again in “The Year of the Pitcher” 1968. In 1968, Mel was 21-12 (third most wins in the AL) throwing 19 complete games (2nd in the AL) with six shut outs (2nd in the AL) pitching in 278 innings posting a 2.45 ERA. In 1969, as the Amazing Mets won the World Series, the AL New York team was in fifth place posting a 80-81 record. Stottlemyre won twenty games for the last time in his career that season. He was 20-14 (third most wins in the AL) with a league leading 24 complete games, posting a 2.82 ERA. Going into the seventies he would win 15 or more games three times over the next four seasons. He led his staff in wins in 1971, coming in second to Fritz Peterson the next two years. In 1972 he led the league in losses for a second time (18). In 1973 he was 16-16 with 19 complete games & a 3.07 ERA as his team finished fourth 80-82. Stottlemyre tore his rotator cuff in June of 1974 falling to 6-7 ending his season after 16 games. In days before successful pitching Surgeries, his career was over at age 32. In 11 seasons he was 164-139 with a 2.97 ERA, recording 1257 strikeouts 40 shut outs & 152 complete games over 2661 innings pitched in 360 games. Retirement: After his playing days he began a coaching career, as a roving instructor for the expansion Seattle Mariners in 1977. 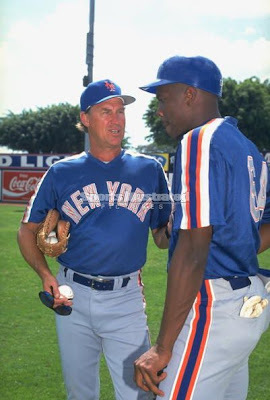 Mets Coaching Career: After five years in his new home state of Washington, he was hired as pitching coach for the New York Mets. 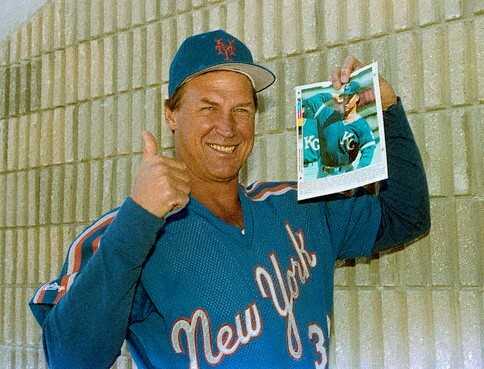 Mel arrived on Davey Johnson’s staff in 1984 & helped develop the great young Met pitchers of that era. First there was the phenom Dwight Gooden, who went on to having one of the best Rookie seasons by any pitcher, followed by a Cy Young Award season in 1985. But there has been criticism that Stottlemyre may have over pitched Gooden in his early years. He was also accused of later ruining him by having him throw less fast balls in order to save his arm. In any event Ron Darling, David Cone, Sid Fernandez, Jesse Orosco, Bobby Ojeda & Rick Aguilera all benefited from Stottlemyre’s coaching. His staffs were among the best in baseball in the ten years of his coaching the New York Mets. 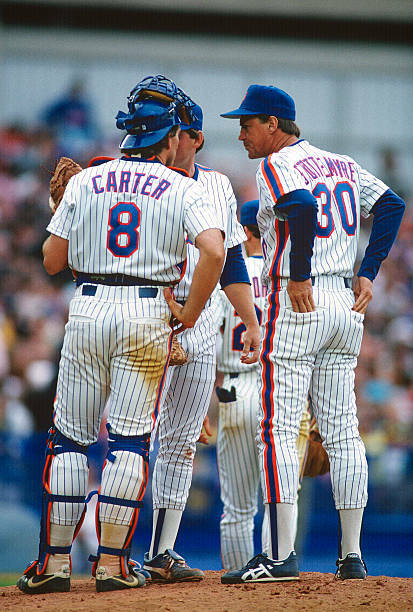 In his first season the Mets went from being 12th in the league in wins in 1983 to third with 90 wins in 1984. They were second in saves (50) & strike outs (1028). The 1985 staff was even better; second in the league in wins (98), third in ERA (3.11) complete games (32) shut outs (12) & first in innings pitched (1488). Mel’s 1986 staff was the best in baseball, coming in first with most wins (108) & strike outs (1081). His staff posted the lowest ERA in the NL (3.13), had the most innings pitched (1484) were second in strike outs (1484) while going on to win the World Series. Two years later the 1988 staff was number one overall again; wins (100) ERA (2.91) strike outs (1101) & second in complete games (17) saves (46) & shut outs (17). But that season the Mets lost the NLCS to the Los Angeles Dodgers. From there things got slowly worse and after two disastrous seasons in 1992 & 1993, all the remains of their championship were gone. 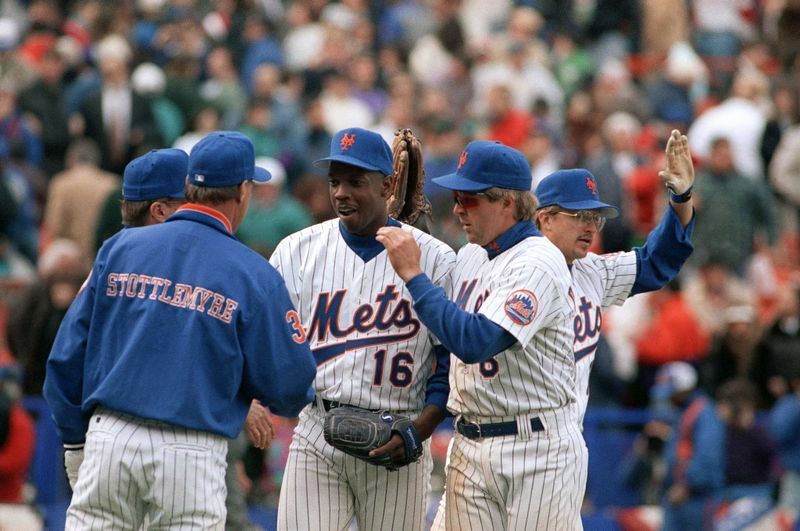 After serving ten years as Met pitching coach under five different managers (Davey Johnson, Bud Harrelson, Mike Cubbage, Jeff Torborg & Dallas Green) Stotllemyre too was gone. In 1994 he had a two year stint as the Houston Astros pitching coach. He then served under Joe Torre with the AL New York team beginning in 1996 & remained there for ten years winning four World Series. In the end he had enough of Boss George, the final straw coming after he congratulated Angles Manager Mike Scoscia after winning the 2005 ALDS over his team. 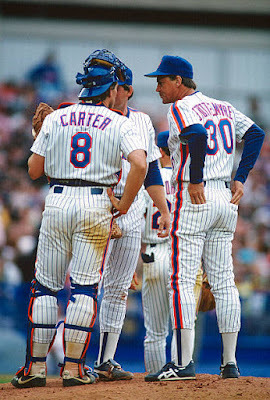 The boss ignored manager Joe Torre & Stottlemeyr's pitching staff’s accomplishments. Stottlemyre resigned in 2008 & was named pitching coach of the Seattle Mariners near his home in Washington. He retired from baseball in 2009. Family: Stottlemyre's two sons, Todd and Mel Jr. both followed their father in becoming major league pitchers. Mel Jr. pitched one season in Kansas City (1990) going 0-1 with a 4.88 ERA in 13 games pitched. He was then a long time coach with the Arizona Diamondbacks organization. Todd enjoyed a 14 year MLB career with the Toronto Blue Jays (1988-1994) Oakland Athletics (1995) St. Louis Cardinals (1996-1998) Texas Rangers (1998) Arizona Diamondbacks (1999-2002). He won 14 or more games four times, going 138-121 lifetime with a 4.33 ERA. He pitched in seven post seasons winning two World Series, both with the Toronto Blue Jays (1992-1993). 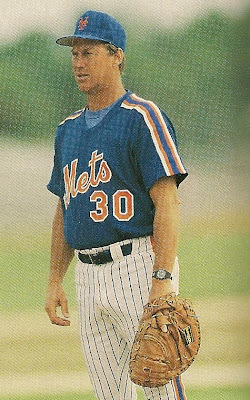 His last post season appearance was in the 1999 NLDS with the Arizona Diamondbacks beating the New York Mets in Game #2. Mel & his wife lost another son after he fell into a coma at just eleven years old. Health: Mel Stottlemyre Sr. was diagnosed with multiple myeloma, a deadly blood cancer. He is an avid supporter of the Multiple Myeloma Research Foundation. Doctors are amazed at how long he was been able to battle the rare disease which affects just 1% of Americans. Medically his cancer was in remission but returned in 2013 & the treatments were tougher for him to take than in the past. He did appear at the 2013 Old Timers Day in the Bronx. Passing: On January 14th 2019, Mel passed away at age 77.